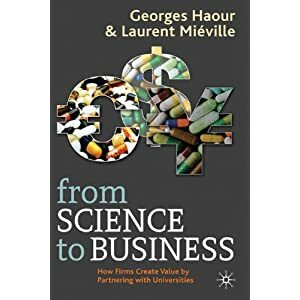 “From Science to Business: How companies create value by effectively partnering with universities” is published this month by PallgraveMacMillan. Authors Georges Haour (Professor of Innovation & Technology Management at IMD in Switzerland) and Laurent Miéville (Founder and Director of Unitec – the Technology Transfer Office of the University of Geneva), look at how companies can leverage their innovative capacity and access valuable knowledge and insights from Universities, using the main channels for knowledge and technology transfer: collaborative research, licensing and spinning out start ups. In this unique world-wide study, China and India are singled out as fast emerging providers of key sources of innovation, not only for their own dynamic markets but also for the world. Primarily addressed to managers and to personnel involved in knowledge and technology transfer, this book will also appeal to all those interested in the innovation process. Available from www.palgrave.com or Amazon.